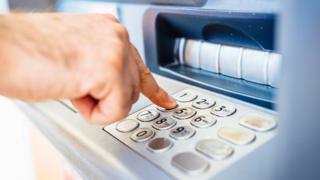 More than 250 free-to-use cash machines are disappearing a month as operators shut unprofitable ones, the network co-ordinator Link has said. There are 53,000 free machines in the UK - but the number is shrinking at a record rate as people use less cash. Now the Payment Systems Regulator (PSR) is cracking down on the closures and asking for more network protection. "Free-to-use ATMs continue to play a vital role in helping people access their money," the regulator said. Hannah Nixon, the PSR's managing director, said: "The requirements we intend to place on Link will help ensure that Link achieves their commitment to protecting the geographic spread of free-to-use ATMs across the UK." Link's ATM Footprint Report found that between the end of January and the start of July 2018, the number of free-to-use ATMs fell from 54,500 to 53,200. That is partly because people are using cash less, Link said, thanks to the rise in popularity of new payment methods such as contactless transactions. But it is also because cash machine operators such as Cardtronics and Note Machine, who get a fee from our banks each time we use one, are finding that fewer of their machines are economic to run. Link said it had set up "specific arrangements to protect free-to-use ATMs more than 1km away from their next nearest free-to-use ATM". The organisation has earmarked some 2,365 free machines in remote and rural areas that it wants to remain open. But 76 of these protected cash machines closed between January and July, 21 of them without even a Post Office nearby to get cash over the counter. The PSR says it is concerned and is taking action to ensure Link meets its commitments. It is also seeking renewed commitments from banks that consumers will continue to be offered services, allowing them to access their cash. But the regulator's intervention on ATM closures may be "too little, too late", warned Nicky Morgan, Chair of the Treasury Committee. She said: "The PSR is rightly concerned by the closures, but I fear its regulatory intervention may be too little, too late. It must ensure that Link is held to its commitment to maintain the broad geographic spread of free-to-use ATMs. Jenni Allen, managing director of Which? Money, said: "Link is failing on its commitment to protect access to cash for people in remote and rural areas who need it most. There are plenty of cash machines in King's Lynn town centre, you'll find most major banks here on the High Street. But some of the surrounding villages have been listed as the worst places in the country when it comes to accessing cash. Lauren, who lives in Narborough in Norfolk, told me she has to travel 10 minutes in her car to get to her closest ATM. She says she always has to be organised and often gets cash back at supermarkets. Lily lives in King's Lynn and told me her closest cash machine is at a Tesco Express which is 15 minutes away. She says she avoids using cash when she can, but does need it for nights out and getting a taxi home.